Welcome to Noji Chiropractic & Wellness Centre! Dr. Matt is back practicing in our Lethbridge office and is now offering Integrated Functional Care as well as NUCCA Chiropractic treatments. This includes Neurofunctional Acupuncture, Shockwave Therapy and Mobility/Stability treatment plans to help improve your Golf Swing! Dr. Janice Noji, Dr. Matthew Noji and Dr. Benjamin Noji Provide Families of Southern Alberta with Natural Healing through Chiropractic Care and Education. At Noji Chiropractic & Wellness Centre, chiropractic is not only our profession, it is also our passion. There is nothing more rewarding than educating our patients about the incredible natural healing ability of the body when it’s functioning properly. 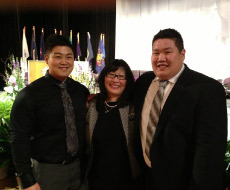 Dr. Janice Noji and her son, Dr. Matthew Noji, both received their Doctor of Chiropractic from Canadian Memorial Chiropractic College. Dr. Benjamin Noji, joined the practice in 2014 after receiving his Doctor of Chiropractic from Palmer Chiropractic College, Davenport. Their goal and focus is to get you to start living a healthier life through the positive benefits of chiropractic care without the use of drugs or surgery. The gentle, non-invasive NUCCA procedure is the primary adjusting technique we use. Ready to take the next step and learn more about chiropractic care? Take some time to look around our website and then give our Lethbridge chiropractic office a call to schedule an appointment and get started today!